Teabagging is a slang term for the act of a man placing his scrotum in the mouth of a sexual partner. The practice resembles dipping a tea bag into a cup of tea when it is done in a repeated in-and-out motion. I have never been in much for political protesting, rallies and the like. About the closest I have ever come to partaking in a political march was two-mile "fun run" in Wildlife Prairie Park back when I was 13 or so. 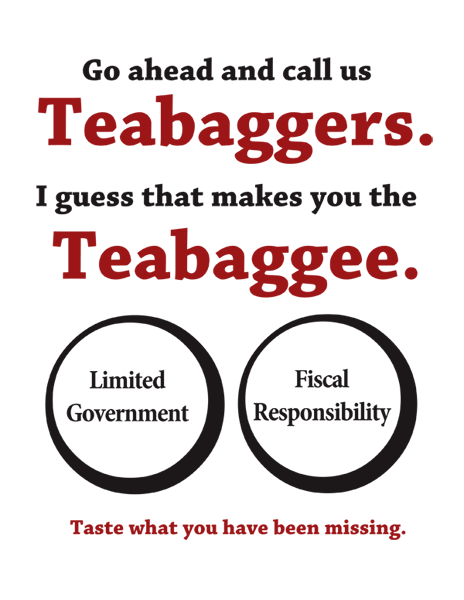 These days, however, I find myself sympathizing quite a bit with the Tea Party movement. Although it is mostly a conservative and libertarian movement, the basic theme of limited government and fiscal responsibility is a constant, and they seem to be committed to calling out big government politicians on both sides of the aisle. It pains me when I hear my more liberal friends and family members go off on the movement. This ranges from the lefty catch-all of calling anyone who disagrees with them a fascist, to pointing out the one less-than-moron in the crowd of thousands who decided to draw a Hitler mustache on a xerox of the president, to spewing the ever-so-clever insult, "Teabaggers!" Really glad I wasn't drinking anything as I would now be cleaning off the monitor and keyboard as well as a substantial area of my desk... Hat tip to the E3 Gazette for the link. This page contains a single entry by DaveH published on April 4, 2010 7:07 PM. President Paul Ryan? was the previous entry in this blog. Light posting tonight - working on other stuff. is the next entry in this blog.